Andy Murray’s girlfriend Kim Sears's presence in the players' box at Centre Court inspired the Scotsman to a great comeback win over Spain's Fernando Verdasco on Wednesday. Murray's predicted stroll to the Wimbledon final became a hazardous obstacle course on Wednesday as he was forced to claw back a two-set deficit against Verdasco to join top seed Novak Djokovic in the last four. Murray prevailed 4-6 3-6 6-1 6-4 7-5 to reach his fifth successive Wimbledon semi-final. Murray's girlfriend had to face some tense moments when Spanish left-hander Verdasco blazed away with his serve and forehand to move two sets ahead. Murray won the third with ease but twice had to fend off break points in the fourth before levelling the match in an electrifying atmosphere on Centre Court. "I think I've learnt how to come back from tough situations more as I got older," said the 26-year-old who was watched by former Manchester United manager and fellow Scot Alex Ferguson. 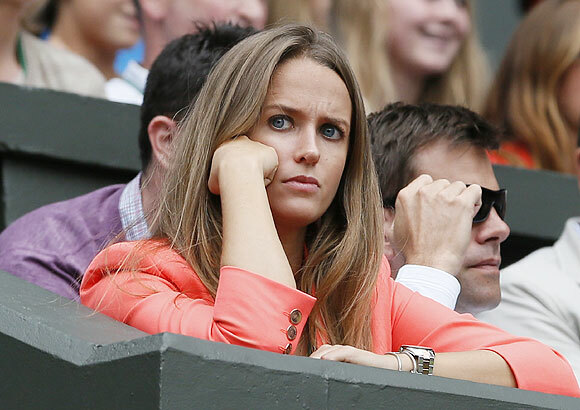 Even World No 1 Novak Djokovic’s girlfriend had to endure stress for a brief moment, but was jubilant in the end. Six-times Grand Slam champion Djokovic had the tougher task on paper against the hard-hitting Tomas Berdych who had won their only previous match at Wimbledon. He edged a high-quality first set but fell 3-0 behind in the second before finding the extra gear that so often comes to his rescue when faced with danger. "It was toe-to-toe in the first set and one shot decided the first set," the 2011 champions said. "Even though I started poorly in the second, I still felt quite good on the court. Just really glad to go through in three." Djokovic won 7-6(5) 6-4 6-3.